Property Location With a stay at Palermo Tower in Buenos Aires (Palermo), you&apos;ll be close to La Rural Convention Center and Estadio Monumental. 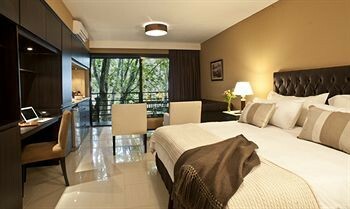 This 4-star hotel is close to University of Buenos Aires and Teatro Colon.Rooms Make yourself at home in one of the 23 air-conditioned rooms featuring private spa tubs and LCD televisions. Your pillowtop bed comes with down comforters and Egyptian cotton sheets, and all rooms are furnished with double sofa beds. Rooms have private furnished lanais. Kitchenettes are outfitted with refrigerators, microwaves, and espresso makers. Complimentary wireless Internet access keeps you connected, and satellite programming is available for your entertainment. Private bathrooms with separate bathtubs and showers feature jetted bathtubs and rainfall showerheads.Rec, Spa, Premium Amenities Take advantage of recreation opportunities including an outdoor pool and a fitness center. This hotel also features complimentary wireless Internet access, babysitting/childcare (surcharge), and tour/ticket assistance. Getting to nearby attractions is a breeze with the area shuttle (surcharge).Business, Other Amenities Featured amenities include complimentary high-speed (wired) Internet access, limo/town car service, and dry cleaning/laundry services. For a surcharge, guests may use a roundtrip airport shuttle (available on request) and a cruise ship terminal shuttle.